The Thomas Fire started on December 4, 2017, near the Thomas Aquinas College in Santa Paula (Ventura County), California which ignited from an unknown cause. It would become a firestorm quickly from the aid of the Santa Ana winds, low relative humidity and higher-than-normal temps. As of today, there are still 620 personnel still assigned on the fire line with most of them that have work throughout the Christmas holidays. With their hard work, dedication and tireless efforts, crews have successfully gained a 92% containment status which will be full contained at 100%. Overall, the fire has destroyed 1,063 structures and damaged 280 more. One person, a firefighter was killed in the line-of-duty. 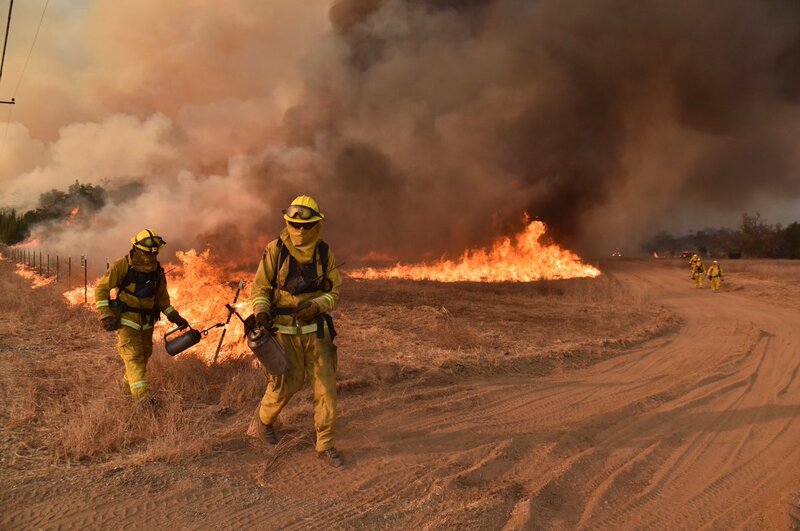 As increased containment continues, firefighters will continue with shifting their efforts to repairing damaged caused by suppression efforts, such as constructing water bars and returning or scattering shrubs and plants along creating contingency lines. The the ICT is prepping to transfer management to the Los Padres NF team leaders on Saturday, December 30th. 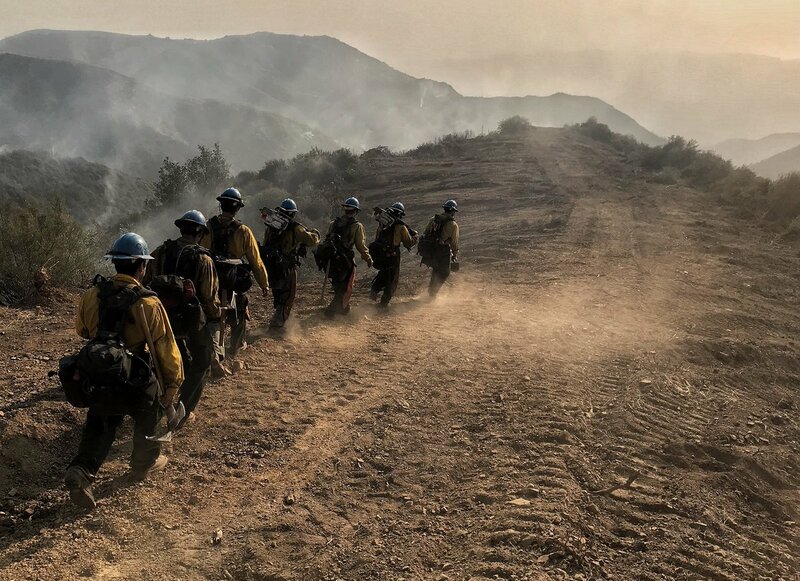 The Thomas Fire is long from being over as it still holds fire resources from their families and loved ones into the Christmas Holiday – a first ever for most of the firefighters attached to this incident. The fire originally ignited on Monday, December 4th about three weeks to this day, as a 500-acre brush fire which started around the Thomas Aquinas College, north of Santa Paula, California. The fire quickly exploded into a firestorm destroying hundreds of structures, livelihoods and killing one life – a firefighter in the line-of-duty. There are currently 1,586 fire personnel that are still working on the fire line, in support roles and in management along with the aid of 116 fire engines, 61 crews, 26 helicopters, 19 bulldozers and 31 water tenders. The IMT unit is being managed by a CAL FIRE IMT Team 4 and 3. CAL FIRE, VCFD, VCSO, SBCoFD, SBCoSO, City of Ventura PD, City of Ventura FD, USFS/Los Padres NF, CAL OES, Red Cross, Souther CA Edison, CHP, CA DOC, SoCaGas, Crimson Pipeline, Wildfire Defense Systems, CA Resources Group, Santa Paula PD, Santa Paula FD, Ventura Co OES, Santa Barbara OEM. The Thomas Fire destroyed 1,063 structures and damaging 280. It has consumed 281,620 acres and is now considered to be an 86 containment status. Cherry Creek Road: Additional 1/2 mile of containment line has been added to the area. On December 18, crews initiated a firing operation north of the main fire and west of this roadway, say Fire Officials. Bear Heaven: Hot spots still remain in the area. Water drops are in effect due to steep, rugged terrain and limited access. Firefighters are working to gain additional containment and work on fire suppression efforts. Ventura to Santa Barbara: Fire line has been contained and secured. No forward progression is expected due to shorter days and lack of recorded winds. Firefighters are making progress in increased containment protecting infrastructure and nearby communities. Mop-up operations are also being conducted, as well as active patrol for any flare-ups or new fire starts. Wildlife: Due to displacement of wildlife from the fire, residents and visitors are being strongly discouraged from feeding or being near these WILD animals for your safety and theirs. If you see any wildlife, you are asked to call 9-1-1 and visit this website for more information. (https://www.wildlife.ca.gov/living-with-wildlife). A NWFB reader brought it to our attention that the #SantiagoCanyonFire in September 1889 aka the Great Fire of 1889, a massive wildfire that burned in three counties: Orange, Riverside and San Diego, California was greater than the size of 308,000 acres. With other wildfires active at the same time, the fire had a growth potential up to 494,000 acres but it did not merge with the others. 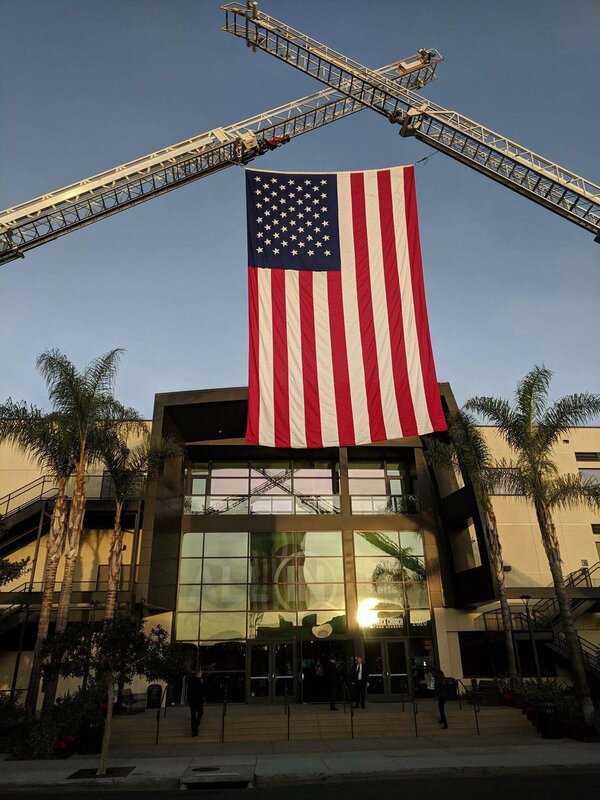 This post is dedicated to CAL FIRE Engineer Cory Iverson who died in the line-of-duty while engaging fire suppression efforts on the Thomas Fire. A Celebration of Life was held today. Our Hearts, Thoughts and Prayers go out to the Iverson Family, his Fire Family, Friends, Loved Ones and all those who Firefighter Iverson touched and impacted everyday. – Ed. 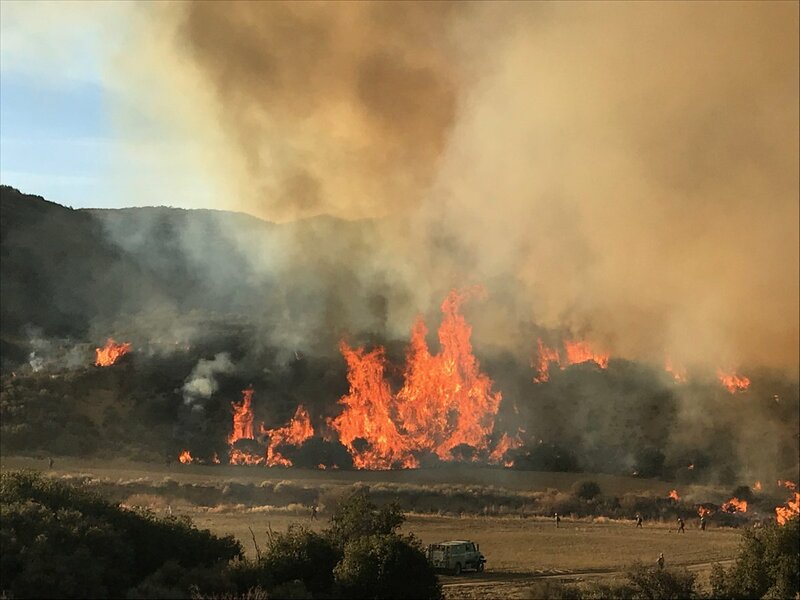 INCIDENT SUMMARY | A 500-acre brush fire broke out near the Thomas Aquinas College in Ojai (Ventura County) California on Monday, December 4, 2017. The fire ignited from an unknown cause which is still under investigation, would become the State’s biggest wildfire in all of their recorded Fire history. According to the USFS, 65% of the fire is still burning on federal lands, which is about 140,862 acres on National Forest System lands. It had crossed over into the Los Padres National Forest and is now located in both the Santa Barbara and Ojai Ranger Districts. CURRENT FIRE STATUS | 273,400 acres. 78% containment status. Fire Fact: There were many Agencies that worked together not only in fire suppression but also supporting both Fire and Law Enforcement personnel, such as the CAL Trans Department in working to keep highways clear and safe. The front country fire perimeter is secure and firefighters will continuing to build upon previous secured established containment lines near communities and other infrastructure. Mop-up operations are in effect along the fire perimeter, as well as active patrol. Fire resources, including firefighters and fire suppression aircraft will remain assigned to this incident for any possible flare-ups or new fire starts. RESOURCES | There are 2,512 fire personnel with the aid of 116 fire engines, 61 fire crews, 26 helicopters, 19 bulldozers and 31 water tenders. The IMT has transitioned over into a CA IMT Type 3. Fire Fact: For most (resources) assigned to this fire incident, this will be their first wildfire assignment over Christmas. COMMAND STAFF | Incident Command is in Unified Command consisting of the Los Padres NF, CAL FIRE, VC_FD PIO, USFS and Ventura County Sheriffs Office. 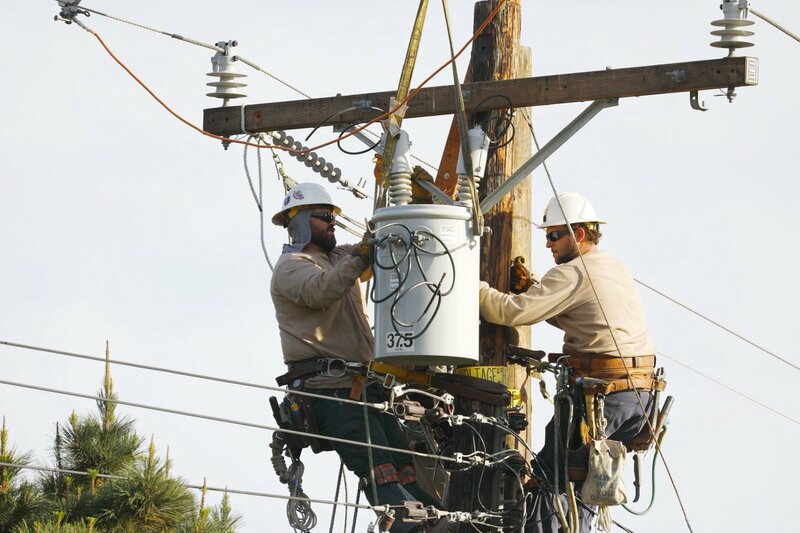 Fire Fact: There are many faces behind the support of a large fire incident, such as SCE crews who work tirelessly to clean up fire-damaged equipment, including poles, wires and insulators. INCIDENT COOPERATORS | Agencies and organizations that were an integral par of this incident were the Montecito Fire Protection District, Red Cross, CAL FIRE, CA DOC, CA DOT, CHP, CA OES, PGE, SBCoFD, SBCSO, Santa Paula FD, Santa Paula SO, So Cal Edison, So CA Gas Co, USDA Forest Service, Los Padres NF, Ventura City PD, VCFD and VCSO. This also includes the hundreds of firefighters that responded 11 U.S. States with fire apparatus and strike teams, additional resources. 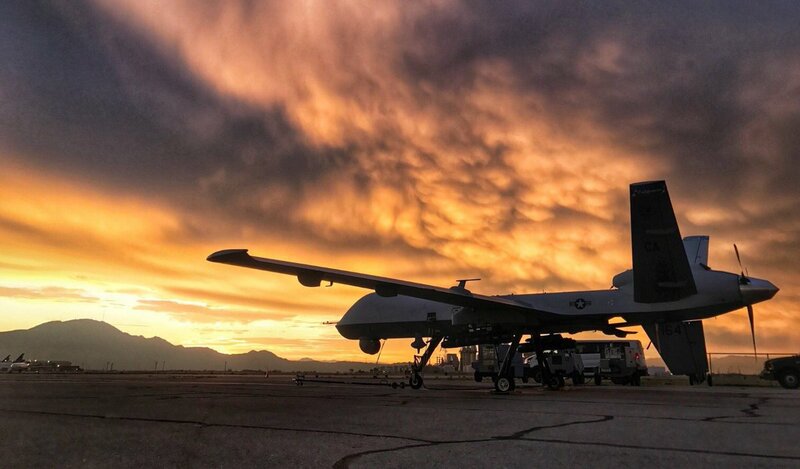 Fire Fact: An USAF Reaper drone which was unarmed and non-weaponized helped provide situational awareness to firefighters during the fire incident. DAMAGE ASSESSMENT | 1,063 structures destroyed. 280 structures damaged. Fire Fact: This wildfire affected more than just those directly involved but will also impact the lives and livelihoods of those for months, if not years. FIRE HISTORY | The Thomas Fire is now the largest wildfire in all of California’s fire history with the Cedar Fire coming in second with 273,246 acres and the destruction of 2,2820 structures in October of 2003. The Rush Fire moves down to third place with burning 271,911 acres with no deaths or destruction of property, however, it did burn up 43,666 acres in nearby State of Nevada in August of 2012. Fire Fact: The Thomas Fire which began as the largest wildfire appeared to be the most photographed up close and personal. INCIDENT SUMMARY | A 500-acre original brush fire broke out near the Thomas Aquinas College in Ojai (Ventura County) California on Monday, December 4, 2017. The fire ignited from an unknown cause which is still under investigation, would become the State’s biggest wildfires in all of their recorded Fire history. Sixty-three percent of the fire is burning on federal lands, which is about 140,862 acres on National Forest System lands. It had crossed over into the Los Padres National Forest and is now located in both the Santa Barbara and Ojai Ranger Districts. CURRENT FIRE STATUS | 273,400 acres. 65% containment status. CAL FIRE states: Crews are mopping the Camino Cielo to strengthen the fireline there. To the north of Camino Cielo, crews will patrol the fire line in the Zaca fire area, and monitor fire spread where line construction has not been possible due to very rough terrain. The firing operation from the past few days will be mopped up and patrolled. North of the community of Fillmore fire behavior has been was minimal where it has backed into the Sespe drainage. Fire spread east of Rose Valley to Bear Haven will be monitored by air. Fire spread has been minimal in this area for the last week, with IR information corroborating that intel. To the north, the fire is slowly moving through the Sespe Wilderness and Bear Haven area, where it is being closely monitored. Carpinteria, the Ojai Valley area, and Highway 126 between Highway 150 and Fillmore are all in patrol status and will transition to unstaffed. RESOURCES | Fire personnel has been reduced to the highest peak of 8,094 fire personnel down to its current number of 2,841. Many strike teams have been released from the fire and returned to their home bases. The highest number of 876 engines, 161 crews, 35 helicopters, 72 dozers, 58 water tenders have been reduced to 171 fire engines, 63 fire crews, 26 helicopters, 21 dozers and 38 water tenders. The CAL FIRE IMT – 4 is to transition to a CAL IMT Team 3 as of 1800 hours this evening. FIRE WEATHER | CAL FIRE: “The dry cold front moved through the area on December 20 and was replaced by weak offshore flow. 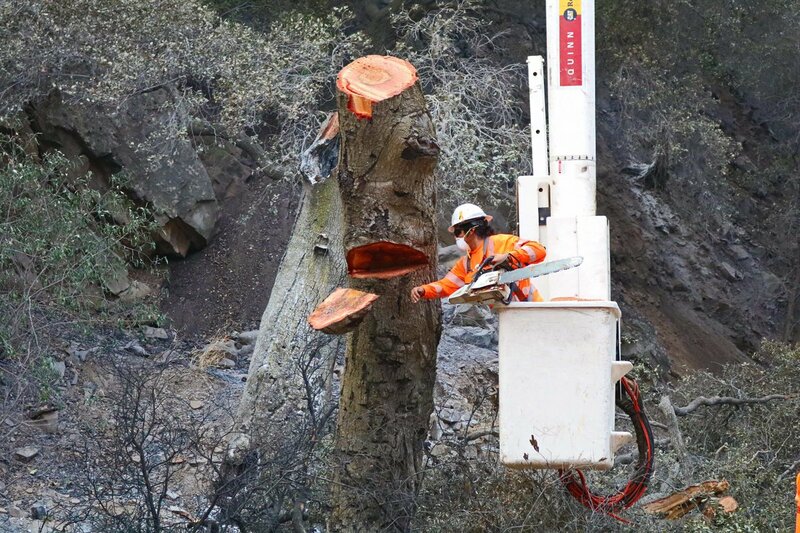 Winds gusting to 50 miles per hour tested firelines in the south, with no notable fire activity in the Montecito area, Camino Cielo or Fillmore. A persistent offshore flow will bring low relative humidity and above average temperatures to the fire area for several days. Fire behavior will increase over the next few days with the lowering relative humidity. FIRE HISTORY | The Thomas Fire is now considered the largest wildfire killing one firefighters and destroying 1,063 structures and damaging 280 . This wildfire has now bypassed previously number one ranked Cedar Fire which burned 273, 246 acres in October of 2003. This fire also destroyed 2,820 structures and killed 15 people. The now third ranked biggest wildfire, Rush Fire ignited in August 2012, destroying 271,911 acres. It did not cause any loss of structures or deaths, however it did burn 43,666 acres in nearby State of Nevada. INCIDENT SUMMARY | The Thomas Fire that started on December 4, 2017, as a small 500-acre brush fire would explode two weeks as of today an out-of-control firestorm. It has grown so much that it is now considered to be the third largest wildfire. CURRENT FIRE STATUS | 271,000 acres burned. 50% containment status. 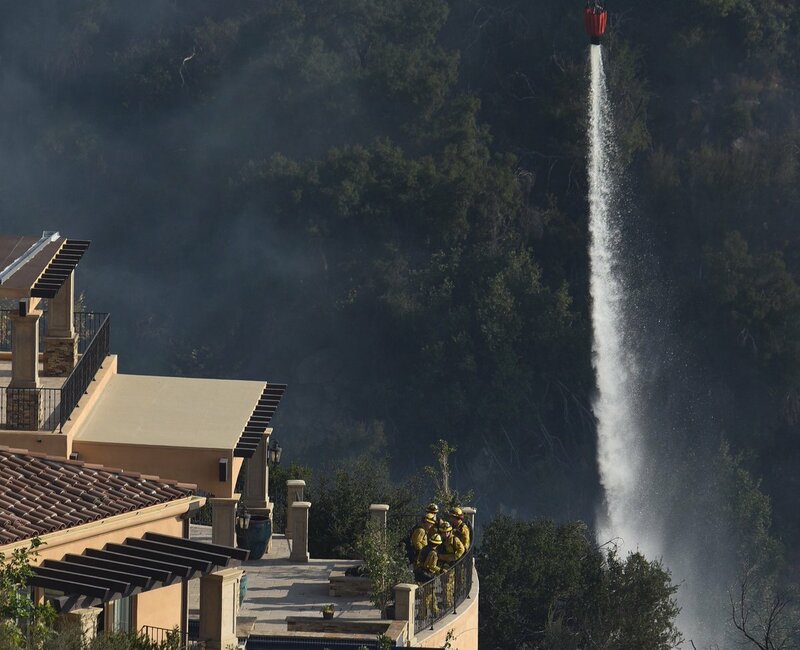 Resources will continue fire suppression activities and tactical patrol in Montecito, and improve the fire perimeter. Mop up and strengthening of containment line in the Gibralter Road area will continue. Direct and indirect fireline construction extending to the north of the Camino Cielo will continue, tying into the Zaca fire. The threat to Fillmore has decreased with the completion of line from town to Devil’s Gate. Continued strengthening of control lines will help to further decrease threats. 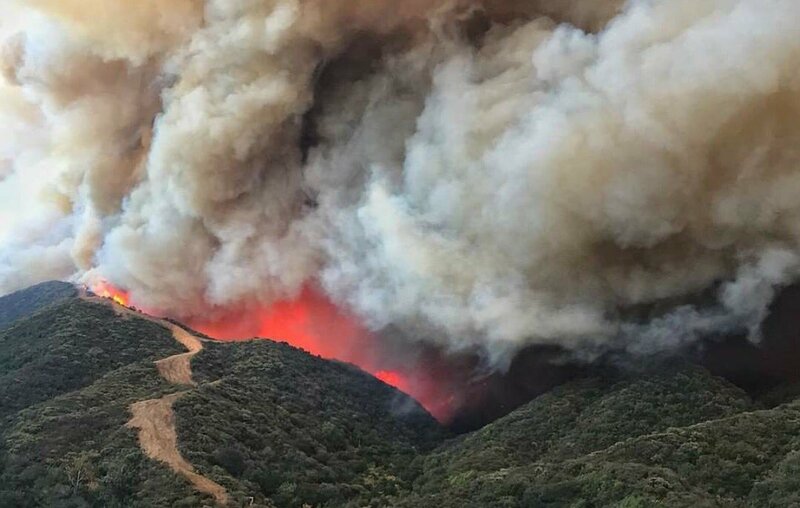 On the north and east flanks of the fire, the fire continues to progress further into the Matilija and Sespe Wilderness and toward the Sespe Condor Sanctuary. Fire suppression repair and Damage Inspection will continue as appropriate based on fire conditions. FIRE HISTORY | The Thomas Fire is now considered the third largest wildfire but due to become the largest within 3,000 acres. The largest wildfire was the Cedar Fire at 273, 246 acres in October 2003. This fire burned 2,820 structures and killed 15 people. The second largest was the Rush Fire that began in August 2012, that destroyed 271,911 acres but did not cause any loss of structures or deaths, however 43,666 acres burned in Nevada. DAMAGE ASSESSMENT | 1,024 structures destroyed. 250 structures damaged. 18,000 threatened. RESOURCES | 8,094 fire personnel. 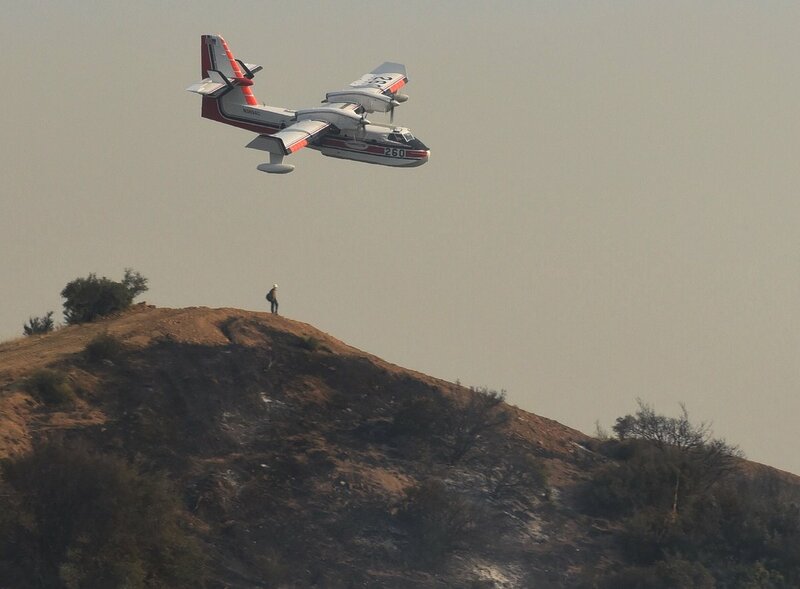 876 engines, 161 crews, 35 helicopters, 72 dozers, 58 water tenders and CAL FIRE IMT-4. FIRE WEATHER | While the weather conditions are improving with an increase in humidity recovery, and decrease in wind speeds, fuels remain critically dry. Thank you for reading our Blog! We wish all of you safe travels wherever you may travel to a fire, with family, to/from work or just hanging out there. Off Auburn Street and Whiting Street, Grass Valley. CAL FIRE incident. 47 acres. 97% contained. Unknown start date/cause. engines. 0 helicopters. 0 structures destroyed. $250,000 cost-to-date. Off Granite Road and Poso Flat Road and 5 miles South of Woody. Kern County. 50 acres. 0% contained. 350 acres. South of Diamond Fork Canyon and 2 1/2 mile southeast of Dry Canyon campground, Fire is being monitored. Crews fighting a vegetation fire in Laguna Creek off of Highland Drive. 0 acres or % containment known. CAL FIRE. Off of Old Chico Canyon, west of Forest Ranch. 30 acres. 70% contained. 10 miles NE of Mammoth Lakes and North of the Owens River Road near Clark Canyon and East of Highway 395. Fire fuels are sagebrush and Jeffrey pine from an unknown cause that is under investigation. The fire started on the afternoon of September 17th. 6000 acres. 20% contained. 483 personnel. 9 crews, 48 engines and 7 helicopters. 4 structures destroyed. $400,000 cost-to-date. Kings Canyon National Park. Fire discovered on August 19, 2016. Located in the South of Cedar Grove in the mountains above 9,000’ elevation. vCause is lightning. 12 acres. Smoldering. Is burning naturally, for the environment benefit. CA IMT4. Illegal campfire is cause. 117,656 acres. 67% containment status. 2021 personnel. 34 crews. 116 engines. 7 helicopters. 68 structures destroyed. Active fire behavior with running, flanking and backing. $206.7 Million. Active fire behavior with spotting. 856 acres. 0% containment status. 513 personnel. 11 crews. 24 engines. 9 copters. 0 structures destroyed. $313,000 cost-to-date. CAL FIRE. Off of Willard Creek Rd and West of Susanville. 2575 acres. 97% containment status. 360 personnel. 10 crews. 15 engines. 0 structures destroyed. $10.8 Million cost-to-date. NEW! AUBURN FIRE – Nevada County. Off Auburn Street and Whiting Street, Grass Valley. CAL FIRE incident. 30 acres. 90% contained. Unknown start date/cause. CANYON FIRE – Vanderburg Air Force Base. Started on Saturday evening .Fire is burning South Base along Santa Ynez Ridge. San Barbara County along with CAL Fire units are assisting VAFB firefighters. Some resources on the fire are SBFD equipment: 3 Type-3 eng, 2 dozer, 1 hand crew, 1 ASU copter. 1400 acres (Unconfirmed). 800 firefighters from multiple agencies are fighting the fire. 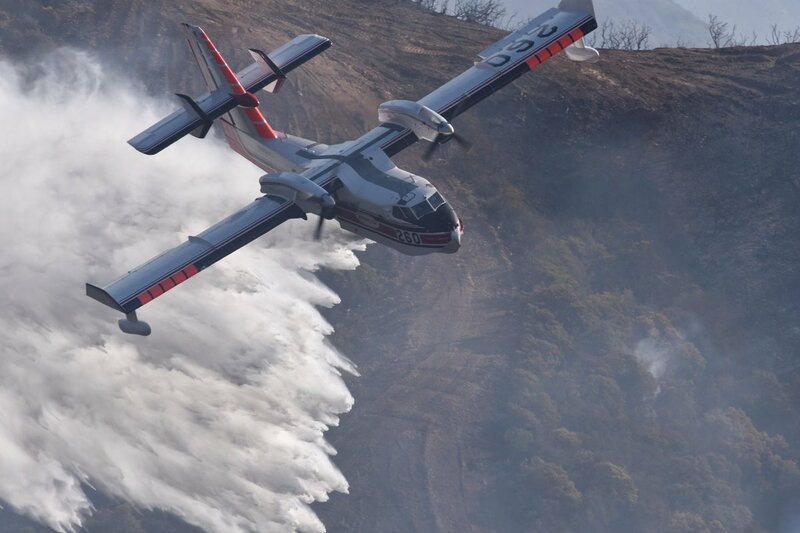 11 Air tankers have been requested. Some are already dropping retardant over the fire. fire exhibiting erratic behavior, unexplored ordinance in area. Hi-Resolution Satellite launch is postponed due to wildfire. 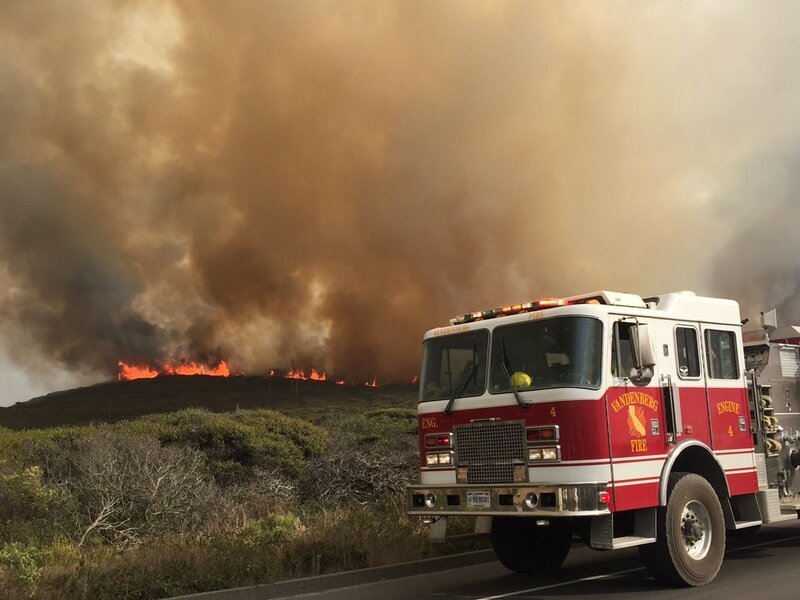 HARRISON FIRE – San Diego. 36000 blk of Mountain Circle Drive.Vegetation fire near Harrison Park Rd/Hwy 79 in Julian. IC reporting forward spread has been stopped. 6 acres. 25% contained. OLD FIRE – Butte County. CAL FIRE. Off of Old Chico Canyon, west of Forest Ranch. 30 acres. 70% contained. NEW! OWENS FIRE – Inyo NF. Located North of the Owens River Road near Clark Canyon, east of Highway 395 in sagebrush and Jeffrey pine from an unknown cause that is under investigation. The fire started on the afternoon of September 17th. The fire has reached a 4500-acre in size with a 10% containment status. Crews are focusing their efforts along the Owens River Road to protect nearby private developments and ranches. 250 personnel are assigned to this incident. The Big Springs Campground, Clark Canyon (a popular climbing area), and nearby ranches and developments have been evacuated. REY FIRE – Los Padres NF. Last report. Fire started August 5th, 2016 from unknown cause that is being investigated. 32,606 acres. 100% contained. 2 injuries. 224 personnel assigned. NEW! SENTINEL FIRE – Sequoia & Kings Canyon NF. SOBERANES FIRE – Los Padres NF. CA IMT4. Illegal campfire is cause. 113,259 acres. 61% containment. 1921 acres. 1 fatality. 7 injuries. 57 homes & 11 outbuildings destroyed. 410 structures still being threatened. Evacuation orders lifted. Resources include: 45 crews, 118 engines, 11 helicopters, 15 dozers, 2 masticators and 11 water tenders. Favorable weather allowing burnout operations. Crews to continue with burnout operations. NEW! SOUP COMPLEX – Modoc NF. Around noon on September 17, six (6) wildfires were reported near the Soup Springs Campground. All have been evacuated. One (1) was contained quickly and four (4) others were contained to less than an acre. The sixth fire is still not contained as winds have been from the west, pushing it into the South Warner Wilderness and away from populated areas. One (1) uninhabited structure is under direct threat. The fire is currently at 300 acres. Located 12 miles East of Likely, California.There are now reports of Soup One that is at 100 acres while Soup Tow is at 200 acres. Resources include: 27 engines, 3 dozers, 2 water tenders, 13 hand crews and 50 fire personnel from multiple Agencies and local Governments. 1 Type 2 IMT is on order and due to take command of the fires on Monday. Moderate fire behavior and spread overnight. WILLARD FIRE – Lassen County. CAL FIRE. Off of Willard Creek Rd and West of Susanville. 2575 acres. 95% contained. The Soberanes Fire continues to burn from an illegal campfire on July 22nd around 0848 hours PDT. It has been nothing but a firestorm spreading from one community to another. Today, the fire has consumed 83,830 acres with 46,636 Los Padres NF land and 37,194 into CAL Fire’s territory. Timber, chaparral and tall grass. It is currently at a 60% containment status. Active fire behavior with backing, flanking and short crown runs. 410 structures under threat. The fire is burning in areas all too familiar with wildfires that hit the area in 2008 (Basin Complex) and 1977 (Marble-Cone Fire). Burning on the Los Padres National Forest in the Ventana Wilderness in Monterey County, California. The Management of the fire is in Unified Command with CAL FIRE San Benito-Monterey Unit and the USDA Forest Service. There are currently 2500 personnel assigned to this incident along with the aid of 48 crews, 65 engines, 13 helicopters, 32 dozers and 50 water tenders. One fatality and three injuries have been reported. At this moment of this post, there are 410 threatened homes outside of the report of 57 homes and 11 outbuildings already destroyed and 3 structures and 3 outbuildings damaged. An evacuation ORDER remains in effect for Coast Ridge Rd. from mile marker 1.5 to Marble Peak at the end of the road. Evacuation WARNINGS remain in effect for the east side of HWY 1 from Andrew Molera Park to Coast Ridge Rd at the Ventana Inn. This area includes the Ventana Inn and Coast Ridge Rd to mile marker 1.5. A WARNING remains for Tassajara Road from Carmel Valley Road to the Tassajara Hot Springs Zen Center. This area includes all roads that lead from the above described roads. All tails, roads and the Arroyo Seco Campground & Day Use area. All California State Parks from Garrapata State Park through Julia Pfeiffer Burns State Park are closed until further notice; this includes Point Sur State Historic Park (Lighthouse), Andrew Molera State Park, Pfeiffer Big Sur State Park Campground and Day Use. Local relief efforts have been provided by the Coast Property Owners Association (CPOA) and the Community Foundation for Monterey County have provided to the fire victims of the Soberanes Fire. Donations can be made to the CPOA at Coast Property Owners Association, PO Box 59, Big Sur, CA 93920 and the Community Foundation for Monterey County 2354 Garden Road, Monterey, CA 93940 (831)375-9712. The American Red Cross is very grateful for the offers of assistance, but at this time we are not able to accept in-kind donations such as food and clothing. Donations enable the Red Cross to prepare for, respond to, and help people recover from disasters big and small. To donate, people can visit redcross.org/donate/, call 800-RED CROSS (800-733-2767), or text REDCROSS to 90999 to make a $10 donation. To find an item or fulfill a need, individuals are asked to submit that information on the organization’s web site: The organization’s phone number is 831-649-3050 montereyco.recovers.org/.